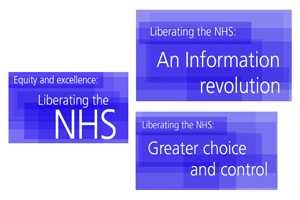 Can health information technology liberate the UK’s NHS? In the U.K., health information technology (IT) efforts in the last century were dedicated to building up systems in individual institutions that, almost deliberately, did not talk to one another. That changed very dramatically during Tony Blair’s administration, with the development of the so-called National Program for IT. The very strong picture developed at the time included a national spine that would allow all healthcare providers to plug in and swap data using a variety of systems. It took almost 10 years to build the national spine, called the N3 network. Supported by a very large broadband network, it is secure and allows some 50,000 individual healthcare institutions and providers to plug into different data repositories. Figure 1 shows the overall architecture of the N3 spine. 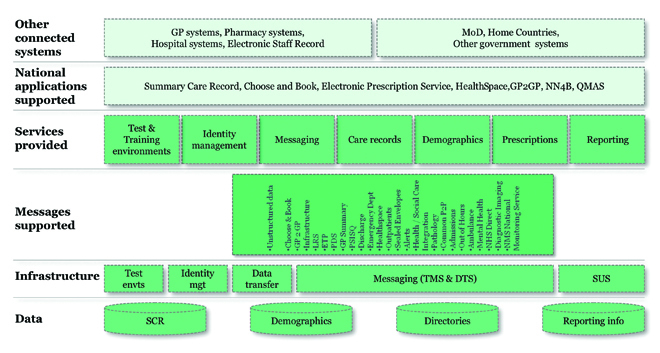 On the bottom line are data repositories, including the summary care record and a very large demographics database. Those connect to service systems, including identity management, messaging, care modules, patient demographics, prescribing and reporting. Every citizen in the U.K. has a unique National Health Service (NHS) number that serves to connect all information about a person for research and care purposes. Progress on the summary care record has been determined mainly by the rate at which general practitioners (GPs) are prepared to upload extracts from their own records into the national repository. GPs have concerns about the confidentiality of patient records and of their own business processes, and there is debate about whether they should be paid to upload summary care records. The scope of the record was recently reduced to facilitate uploading. It will be used for general practice and emergency care purposes and will limit information to patient demographics, allergies, adverse reactions to past treatments, and a detailed record of current medications. People can see their summary care record through a Web-based application called HealthSpace, which looks a little bit like Microsoft’s Health Vault but is sponsored by the NHS. At the moment, about 270,000 U.K. citizens have a HealthSpace account, which is very small uptake out of 65 million people. Opening an account is deliberately made difficult for confidentiality and privacy reasons. Individuals have to come to their doctors with three different forms of ID to open an account. There may soon be a Web-based sign-up process to encourage greater uptake by patients. Since the late 1990s, virtually every GP in the U.K. has had a desktop computer connected to the Department of Health. That was accomplished with the Quality Outcomes Framework, whereby GP payment depended on them uploading information to the Department of Health. All GPs now enter structured data directly using SNOMED terms during each patient encounter. (The systematized SNOMED CT nomenclature of medical-clinical terms was originally created by the College of American Pathologists and is considered to be the most comprehensive multilingual healthcare terminology in the world). Only in very rare instances, however, does the primary care network communicate with the secondary care network. Advances and innovation within the hospital sector have been much less bold and have been frustrated by slow adoption among clinicians. Vendors have had problems supplying software that actually works and can connect through the spine. All GPs use computerized systems to capture patient records. There are about 8,000 GP practices connected to the N3 spine, and they can transfer records from one practice to another as patients move around. About 1.2 million patient records have moved across the system over the last five years. Prescriptions from GP practices are sent electronically to pharmacies. Patients do not need to carry around a prescription, but pick up their drugs using identity cards. They can also obtain repeat prescriptions using that system. Hospitals use electronic prescribing much less. The Choose and Book system allows a patient to choose his secondary care provider with his GP. About 28 million outpatient appointments with secondary care providers have been made using Choose and Book. Under the new coalition government, the National Program will be wrapped up. The original vision has largely been achieved and there is a functioning national system into which everybody can plug their systems. The challenges now are making these systems more interoperable, providing incentives for people to adopt them, and driving development of IT systems in secondary care and hospital settings. The white papers have to do with handing power over to individual patients and putting patients genuinely at the centre of healthcare processes and transactions. Some of the characteristics being sought are very easy access to health services, treatment of people as individuals, and commitment to safety and quality. “No decision about me without me,” is the catch phrase of the moment. The white paper entitled Greater Choice and Control details how, at policy level, the U.K. will provide individual citizens with a choice of institution and doctor. This was tried under the previous administration but not much progress was made. Until people really understand what doctors, hospitals and primary care centres do, it is very difficult for them to make informed and sensible choices about who to see and where to see them. The white paper An information revolution explores ways to make some of that information available to citizens. The goal set out for the next five years is to improve data quality, comprehensiveness, availability and use. Patients will be able to view all clinical and social care records. Structured data entered after the fact will be replaced by first pass clinical entry driven by payment mechanisms. Data about service quality will be much more simply described, so that people can use it to plan out their care pathway. Similarly, data for our healthcare regulators will be improved. The very high-quality data available in primary care will need to be connected to secondary care systems, and more detailed information standards enforced to improve interoperability. Even as it introduces disruptive policies that might drive significant change, the administration has reinforced some of the institutions people regard as beneficial. The National Institute for Clinical Effectiveness (NICE) and the National Institute for Health Care Research (NIHCR), both of which have made profound and very substantial changes to how doctors and nurses work in the U.K., will stay. The Information Centre will be strengthened and developed as a central tool for administering and centralizing data, and for providing the sort of information systems described above. The NHS constitution, which was published two years ago and sets out a series of commitments from the NHS, is still very much part of the overall national offering. A series of disruptive measures has been proposed to drive change more rapidly. The most important of these involves abolishing, in a year’s time, the centralized system for commissioning care delegated from Parliament to the Department of Health to strategic health authorities and primary care trusts. GPs will be directed to form commissioning consortia and purchase care through their own networks. About three-quarters of the current NHS budget, or £80 billion, will be distributed to GP consortia to purchase care. The theory is that this will improve efficiency and responsiveness within general practice, and drive competition and effectiveness in the secondary care sector. There will be an economic regulator, the successor to an institution called Monitor, which regulates quality in the so-called Foundation Trusts. The new Monitor will develop a much stronger economic function and will deal with failing hospitals and failing supply chains in a way that the U.K. has not seen before. Public health delivery will be turned back over to local authorities. The principle of care provided by local authorities in Victorian England has been reinvented and may be a very effective way of reaching, for example, a local population with significant obesity and diabetes problems. It will enable local authorities to make interventions around access to playgrounds, sports fields and so on. This has not, to date, been part of their mission. Finally, the monolithic NHS will be broken up and citizens will own parts of it as non-profit social enterprise concerns. The care record is seen as the primary source of data and drives the creation of intelligence in the system, which can be used to both commission services and provide information for individual patients. Data flows will change over the next three years. At the moment, every institution in general practice and hospital-based care makes a central return, known as the health-episodes statistics. Institutions send additional data sets to Commission Control on healthcare-acquired infections, performance against quality improvement indicators, estate and facilities, prescribing costs and activity, and overall NHS performance, along with organizational reference data and some basic information on patient environment. In the next year, much deeper information on individual providers will be made available to citizens on a Web site called NHS Choices. Similarly, the Choose and Book system will have better quality outpatient information at provider level as opposed to whole-system level. Additional indicators will be made available for wait times, processing of accident and emergency cases and ambulance status reports, and the quality of information on procedures and diagnoses will be enhanced. In two or three years, much better data on outcomes for cancer, heart disease and other conditions will be available to the public through NHS Choices. Finally, the activities of clinicians will be connected to what is spent through the NHS and the commissioning process. The two have been dissociated far too long, and most physicians are still bewildered about the cost of their activities and what they might do to contain those costs. 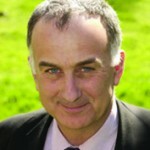 Dr. Charles Gutteridge was Medical Director at Barts and the London Trust from 2002 until 2010. He is a consultant hematologist at Barts Hospital and at Newham General Hospital. As a member of the London Review Acute Group, he provided clinical advice to Lord Darzi’s review of health provision in London. Dr. Gutteridge chaired the Association of U.K. University Hospitals Medical Directors and has been strongly involved in patient safety, confidentiality and informatics issues at Barts, leading the Safer Patients Initiative 2006-2008 and chairing the Clinical Informatics Design Authority. As National Clinical Director for Informatics since January 2010, he is responsible for delivering informatics to improve patient care and facilitating dialogue between clinicians, patients and informatics providers.